News2me2005 is back tonight with a guest review of the latest Vader hitting shelves. Now, if you want to know absolutely nothing about the film, then read no further, and God forbid, don't look at the photos! However, if you've seen episodes 4, 5, and 6, this really shouldn't be all that much of a surprise...let us in on the secret, news2me! With Episode 3: Revenge of the Sith just 21 days away…the toy line is hitting shelves in full force (pun intended). 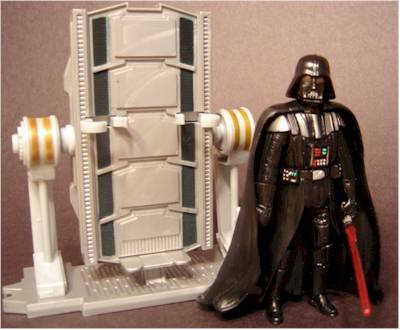 The first onslaught of figures were your basic heroes and villains, with the deluxe figures giving away nothing too spoiler-ish, (if you didn’t know that Anakin became Vader, then you are like the many people that went to see Titanic and were surprised that the boat sank). We have all by now seen the trailers of Vader on the steel table, rising into frame. Like all the packaging for the deluxe figures this far, it is a love it or hate it scenario. I like that it has a rounded bubble and that it shows off the contents very well. 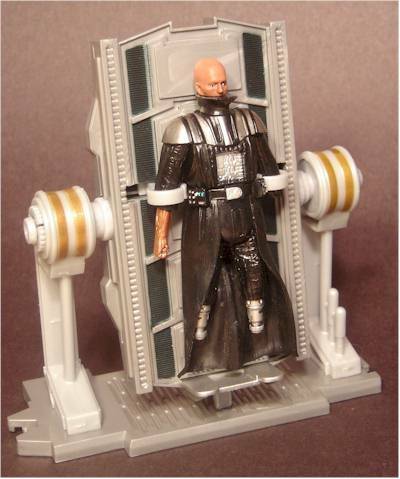 I hate that it is not collector friendly and in order to extract your Mini-Vader from his plastic prison, you must have the skill of an advanced recon trooper. 2 twisty ties and a clear elastic band are all that hold him in, but don’t expect the package to make it through. The sculpting is fairly decent. It is a nice representation of a crispy Anakin (all though it isn’t too graphic we must stay kid friendly remember). They did a very nice job of sculpting the scars and battle wounds. But lack painted highlights, more on that in a bit. Vader’s helmet is nicely sculpted as are his boots and body. 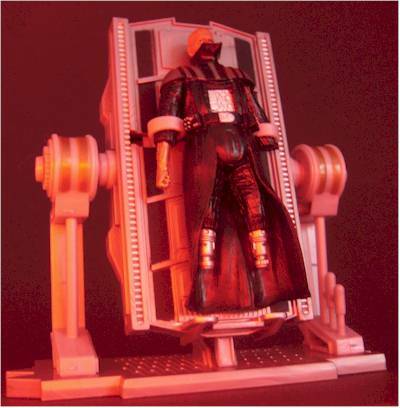 This figure is a kind of do-it-yourself build a sith lord kit. 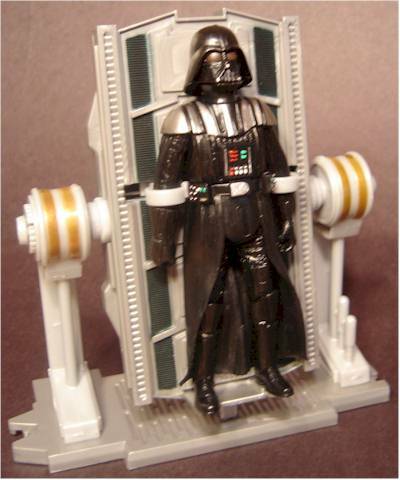 The sculpting on the operating table is very well done as is the sculpting detail on the Vader suit. 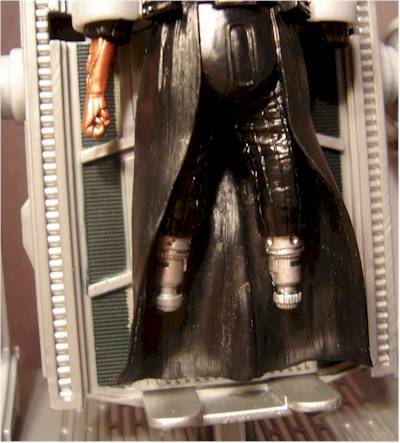 Even his cybernetic legs are done very nicely. As is his mechanical right hand. But to me the best part is the cape. It is hard plastic and when it is on the figure touches the floor. “So what!…” you might say.. 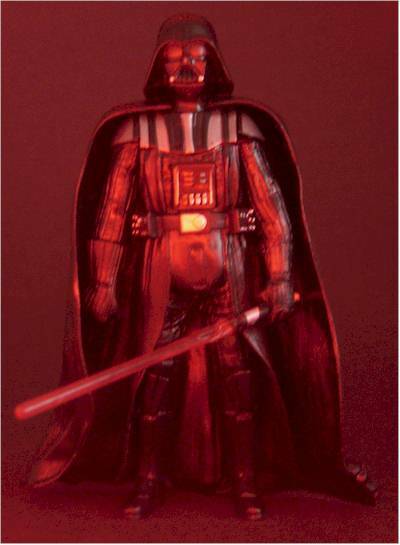 Most Vader figures have capes that touch the floor. Ah yes.. But this one actually is sculpted to look like the cape is lying on the floor at the bottom. A very nice touch. So why not 4 stars? Two reasons. On the right hand that you put his black glove on…the sculpt on the glove is big and bulky. Why they chose a slide on piece as opposed to a snap on piece, like the rest of the parts is anyone’s guess, but I suspect a great many folks will have his bulky “I got stung by a bee” hand hidden behind the cool cape. The second is his face/bottom of the Vader mask. There is no detail on the inside bottom of the mask.. None. So With the helmet off you have Anakins head in a mask with no detail. But I am extremely nitpicky. To the casual consumer they will not notice. The paint on the figure where applicable is decent. The silver of the shoulder armor is nice and vibrant and the chest box is well done with no noticeable slop. Anakins eyes are also well done, but I did notice on a few others they were slightly off. My one bone of contention is his face. It is a very nice ¾ sculpt of a bald, burnt Anakin. He has his scars and is battle damaged, but there is no paint to highlight them. It is just the same burnt skin color. It would have been nice to see some redness in the scars not just the same skin color. The table is very well done and looks just like it does on film. Insert your Homer Simpson “DOH” here. The figure has so much potential for articulation. In fact it screams articulation. But alas, the articulation is very basic. A neck cut, shoulder cuts, wrist cut on the left hand and hip cuts are the basic articulation with the figure. Now once you put on both legs and right hand you get basic swivel cuts at the knee and another wrist cut. Seems like they just decided to CUT out most of the possible articulation. It would have been nice to have a Vader you build and then can pose in some nice dynamic poses. 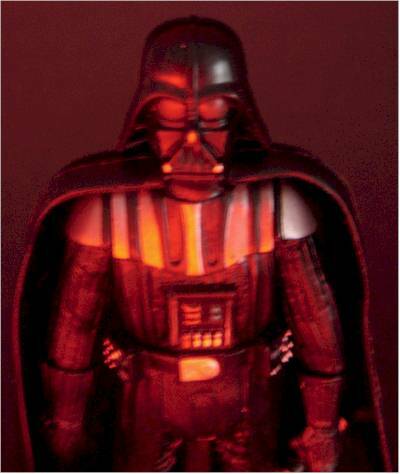 How hard would it have been to modify the OTC Vader sculpt? Now you can add another star to this if you consider all his needed parts accessories. I do to a degree. But really his main accessory is the operating table and his trusty red light saber. 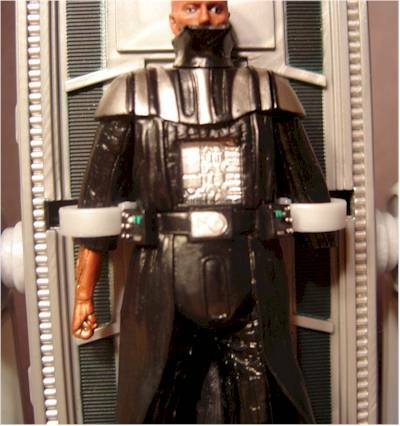 The helmet, boots, hand and chest box are nice, but without them it would be Darth Gimp, not Darth Vader. It is a fun toy. It also makes a kinda cool display piece. 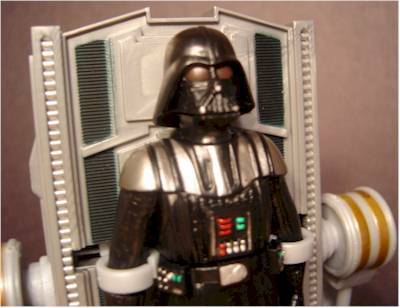 Plus when you put him all together you have a very cool looking Darth Vader figure. 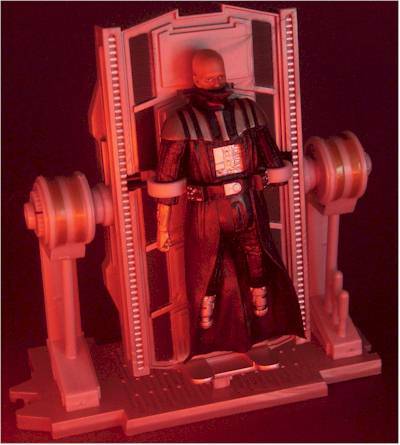 Kids will definitely enjoy this, and collectors will like seeing how Vader was born, but in action figure form. If you are a Darth Vader fan. Like myself, this is a must have. If you ar a Star Wars fan, this is a “would be nice to have.” If you just like the idea of putting Humpty Dumpty…oops I mean Vader, back together, you will like this. Basically it has its shortcomings, but really what toy doesn’t. It’s worth the money. Worth the money, and also in my opinion a needed figure for that Episode 3 collection. These are currently all over Ebay. I suspect they should be hitting store shelves very, very soon. Figure from the collection of News2Me2005.